August has been a busy month and our international reputation is growing having sold 5 horses to Saudi Arabia and with new clients everyday from places as far afield as Australia, Japan, the US and Mexico. It is great to see that the fine qualities of the Spanish horse are appreciated in all corners of the world. We wish all our proud new owners all the best with their new horses. Finding a Spanish horse is inevitably an emotional experience - there are thrills (hopefully no spills), there is laughter, there can be disappointment, there is beauty, there is heat and dust, there is worry and there is excitement, and most importantly there is love. 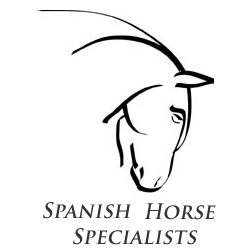 This is the reason we call ourselves Spanish Horse 'Quest' because we realise that from the moment the Spanish horse catches your eye to the bond you develop when you finally get your dream horse home, there is a journey - an external and an internal one. We see our role as supporting you in every stage of the journey. From the start: whether you are just enquiring and enjoying the beautiful horses on our website, or you have decided to join us in Spain to view these magnificent animals in their country of origin, or perhaps you cannot get out to Spain to view your horse and so we bring the horse to you in your home by DVD, information and communication. The bit in the middle: when you've made a decision on your horse, we will organise everything from the sales contract to the vet exam and export papers; when you lose out to someone else on a horse you've set your heart on, we will help you get back on your quest to find another, and when you're anxiously awaiting the arrival of your new horse, we will give you all the advice you need on feeding, management and settling in your new horse and keep in touch with you on every step of its journey. In the end: when you have bonded with your horse and are living happily ever after, we love to hear about it. The nature of this work means that we do tend to become good friends with our clients and we also care enormously about the wellbeing of the horse. The breeders also often ask how their horse is and if the new owner is happy and it is good to be able to report back to them. While there are a few unscrupulous people in this business, there is an overwhelming majority of wonderful people who all share the same passion for the horse. Nowhere is this more evident than in Spain where the mention of horses even in the chic urban centres of Barcelona or Granada will create instant rapport. So, back to love. It is all around, particularly in your stable...and if it isn't, get yourself a Spanish horse! It is very rare to find high quality pure bred ridden mares with full manes and tails and all the flair of a stallion in Spain, because they are usually hard at work producing foals. Beautiful Carthusian mare with long flowing mane and tail and great movement. 16hh, 8 years old, excellent character and very good Cartujano and Yeguada Militar bloodlines. A ridden and well schooled high quality mare is a type hard to find. New Feature Stallion - Elegido! 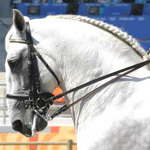 A great opportunity to buy a beautiful stallion with good bone and conformation at a perfect age and currently competing at medium - advanced medium dressage. Lovely dark bay, 7 years old, very good natured, impressive movement. Viewing next week, more photos, information and video available shortly afterwards. Please do not hesitate to get in touch with details of your 'quest' and we will be very happy to help you. P.s. Sometimes our newsletter can end up in your spam box by default, if you value it and do not want to miss next months, please save it as non-spam.